I just wrapped up my first real book tour, in support of the Hieroglyph anthology. 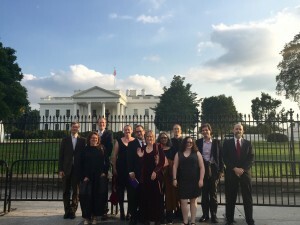 I was lucky enough to attend events in NYC, DC, and Ottawa. So, it was a tiny tour for me, but it was pretty packed. 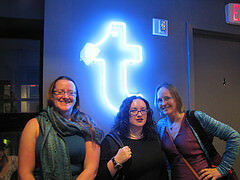 At Tumblr we did a reading and drank much iced tea. Every time I’m in the States, I try to drink as much unsweetened iced tea as I can. The only iced tea you can get in Toronto is Nestea, and it tastes like the bait left out for wasps in Hell. Pun intended. The next day we set off for DC, for a meeting at the Office of Science and Technology Policy with even more of the Hieroglyph authors. It was a lot of fun. The people at OSTP I met seemed to love science fiction as much as they loved The West Wing, and could trace their careers to both sources. Plus, White House security guards do a more thorough job than customs agents, but they’re a lot nicer about it. There’s no real need for intimidation tactics. It’s the White House. You’re already intimidated. I had to sing for my supper, you see, because I’m sitting next to Bart Gellman, the guy who broke the Snowden story for the Washington Post. It was a little scary. I still don’t quite believe that it happened.